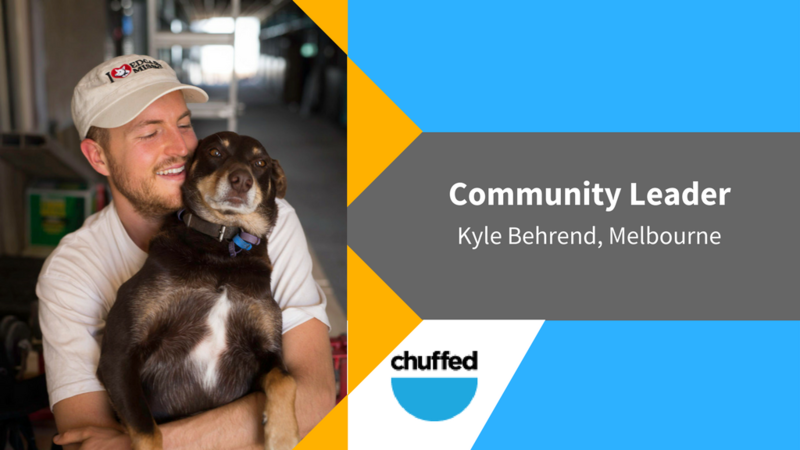 Meet Kyle Behrend, Chuffed.org's Melbourne-based Community Leader. Kyle began charity work as a volunteer for Edgar's Mission Animal Sanctuary - check out how his belief in cultivating kindness has led him to run several $100k+ campaigns on Chuffed.org below! For as long as I can remember I have always loved animals - from my families own pets including dogs, chickens and tortoises, to adventures to the game reserve -marvelling at the incredible African wildlife. But I never quite knew where I was headed. I changed university courses more times than I changed clothes back then and somehow finished with a double major in Human Movement Science and Finance. Adventures around the world lead me to Australia where I found my calling – to work at Edgar’s Mission Farm Animal Sanctuary. I was instantly amazed by the incredible work Pam Ahern was doing rescuing and advocating for the most abused animals in our society – the animals who are farmed for food and fibre. After several months of volunteering in 2010 I became the first staff member on the team which has now grown to 13. I have helped with many roles from farm cleaning, maintenance, animal care, accounting, vet runs and rescues, however, I have now settled into the role of manager of operations of the farm. This role includes fundraising, communication, tours, website and donor management with a good dose of photography and video creation rolled in there as well. I have helped run 3 successful crowdfunding campaigns on Chuffed and was honoured to be invited to become a community leader so I can share everything I have learnt along the way with those just starting out or looking to improve their crowdfunding campaigns. I believe that humanity thrives on helping others and I have been blessed to have received so much support and knowledge from incredible people in my life - now is the time to repay that kindness by sharing my knowledge with others. In 2014 we reached a point where Edgar’s Mission had outgrown the original sanctuary on 60 acres, caring for just over 150 animals, and we faced not only the daunting task of finding a new forever home but finding the funds to secure it! The only way we could realistically secure our much-needed home and infrastructure was by enlisting the support of those who too believed in our work. Crowdfunding, we felt, could help us achieve this. However, what came next simply blew us away! We reached our first target of $50,000 in just three days! And it was in that moment that we knew we were not alone, and supporters were prepared to not only talk the talk but walk the walk all the way to our new home with us! What was just so heartening was that this support came from not only people who had visited the sanctuary but from hundreds and thousands of people across the world. Crowdfunding was the best tool available to unite us on our common goal in giving rescued farmed animals the best life possible. What social cause are you passionate about and why? There is a wonderful quote by Ghandi that says “The greatness of a nation and its moral progress can be judged by the way its animals are treated.” I think the way we treat the most vulnerable in our society tells the world so much about the people we are and if we start caring about farmed animals our love and kindness will ripple out into the world, creating a kinder world not only for them but for other animals, humans and the planet as well. At this time we face more uncertainty than at any other point in our history, yet I believe that through cultivating kindness we have our greatest tool to not only unite us as a species but ensure the survival of our planet and all of her inhabitants. I will be discussing our three campaigns and what made each one different, the tools we used, what worked, what didn’t, unexpected challenges like reaching our target in three days, the differences in the campaigns, how crowdfunding can be used as a stand-alone fundraising tool or in conjunction with other fundraising, the importance of a supporter base, resources required, timing, project management and more. All funds will go back to helping care for the over 450 residents currently residing at Edgar’s Mission Farm Sanctuary and fulfilling the pledge we have made not only to these animals but to the people who have donated – we will give the animals a life truly worth living along with our eternal thanks to everyone who has made this possible. Get more info and tickets to Kyle's Crowdfunding for Social Causes Workshop in Melbourne on the 7th of August 2017 here.